I noticed that I am getting closer to hitting 100 "Likes" on my facebook page. I have a small gift for the 100th person to like my page!!! Something small, but handmade and easily mailed to wherever you live. One small town in the smallest State held the biggest surprise for me last week. When taking the ferry to spent the day on Block Island, RI, I had no idea that the island has a small fiber industry! Had I known, we would have gone earlier to take the daily tour around the mill at 10am. As it was, we only saw the advertisement while leafing through tourist information over lunch. Finding out that the location of "North Light Fibers" was just a short walk from the harbor restaurant, cinched the deal and we merrily walked up to 129 Spring Street. or better yet the actual place!!! When we first entered, we were greeted by alpacas, very soft and very gentle creatures, which looked like they had just been sheared. They also did not want to look up to be photographed; they were too busy eating. The building houses the solar powered micro mill, an area where the yarn dying takes place and the shop area. The shop offers yarn, patterns and also finished projects both woven and knitted. Some were finished locally and some far away, representing work by the group "Women for women" (click on the link for more information on this organization). Even without the tour of their mill (you can see photos of it on their website here: http://www.northlightfibers.com/the-mill ), there was SO MUCH to see and, yes, TOUCH! I decided on something quick and uniquely "Block Island". A kit for a Block Island Hat, part of the proceeds to benefit mariners served by the Seamen's Church Institute "Christmas at Sea". I believe that one can never have too many hats. Although I could also send the hat in after finishing, but I am planning on keeping it as a fond memory of this place. shopping experience was further enhanced. As if planned, everyone who came to Knit Night at The Knitting Garage at AL Stickle's last Monday was working on a cardigan! Beth finished her cardigan in Cascade 220 Super-wash paint. Well done, Beth! Just a few yarn ends to weave in. 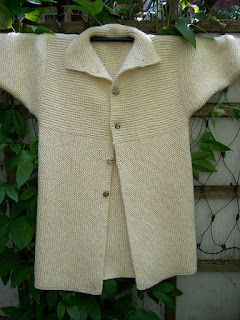 I was working on my "Featherweight" Cardigan in Lace weight yarn; pattern by Hannah Fettig. I am making this deliberately loose to have something comfy and light to slip into on cool summer evenings :) Here is the link to the pattern information on ravelry: http://www.ravelry.com/patterns/library/featherweight-cardigan I have not yet decided which stitch to use for the collar, but I have a little time till I get there. Knitting Lesson # ? : Persistence helps you reach your Goal. Although it is a little too warm to wear right now, it was the perfect timing for Jim to receive the cardigan. One of them to congratulate him on new ventures in his business E A Content Services. Have you ever had a project you did not feel too inspired to do, but felt compelled to do anyway and were glad you did? Here is my story on just such a project. I have to go back in time to start this story. Do you remember when my friend Marie passed away two summers ago and all her yarns were donated to two of the local libraries (Red Hook and Tivoli)? Now forward to a few months after that which brings us to Fall 2014. Hildegard and Bonny, again from the Tivoli Library, approached me with a half finished cardigan which was in Marie's stash. Obviously she had started to knit a cardigan for her husband Jim. The back was done, and so was the right front. The left front was partially done. There was enough yarn to finish the project and the pattern was there. Of course I volunteered to finish this. It took me a while to get started. After all, this was not just something Marie had bought, but never started, but this was something she had actually worked on. Aside from feeling rather emotional about this (but some times in a good way as in feeling connected), I had to also try and match her gauge and figure out some changes she had made to the right front. After all the two fronts needed to match. Beginning of this year I decided that this would be one of the projects I wanted to finish. There were a few other things I had promised to work on, but in March I started to work on the cardigan. I decided that on the days I was home I would not knit anything else until after I spent one hour on this project. Then I was disciplined enough to stick to this and 35 hours later I was sewing on the last button! The lesson I learned is that you can finish anything if you just do a little each day consistently. I finished this really cute lacy layering top for my daughter-in-law. Shhhh, don't tell her that it is finished, because I am borrowing it for a week or so to display at The Knitting Garage at Stickles. This came out really nice and I cannot imagine anyone not wanting (at least) one of these for their summer wardrobe. The Yarn: I used Cascade Sunseeker which has a little glitz in it which looks really cute when the sun makes it sparkle. This yarn is a cotton /acrylic blend and seems perfect for this top. It has a nice drape to it and does not get too stretched out. It is also easy on your budget at $8 per skein (about 2 1/2 skeins needed) and it comes in a lot of gorgeous colors! Three ways to wear it: You can wear the top loose or thread a ribbon through the sides and tie it in the back for a more fitted look. Either way looks great.